Front of the recipe card for Impossible Coconut Pie. 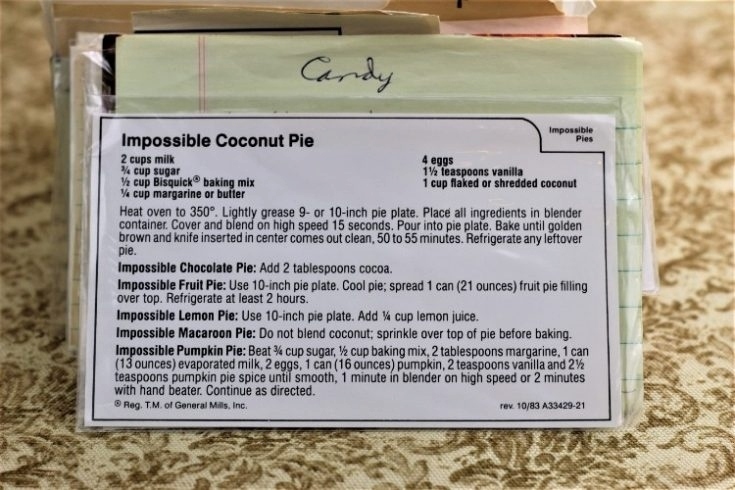 There are lots of fun recipes to read in the box this recipe for Impossible Coconut Pie was with. Use the links below to view other recipes similar to this Impossible Coconut Pie recipe. 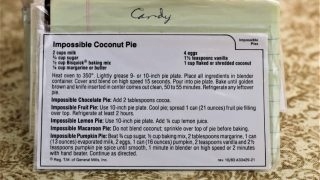 If you make this Impossible Coconut Pie recipe, please share your photos and comments below! Lightly grease 9- or 10-inch pie plate. Cover and blend on high speed 15 seconds. Bake until golden brown and knife inserted in center comes out clean, 50 to 55 minutes. Impossible Chocolate Pie: Add 2 tablespoons cocoa. Impossible Fruit Pie: Use 10-inch pie plate. Cool pie; spread 1 can (21 ounces) fruit pie filling over top. Refrigerate at least 2 hours. Impossible Lemon Pie: Use 10-inch pie plate. Add ¼ cup lemon juice. Impossible Macaroon Pie. Do not blend coconut; sprinkle over top of pie before baking. Impossible Pumpkin Pie: Beat ¾ cup sugar, ½ cup baking mix, 2 tablespoons margarine, 1 can (13 ounces) evaporated milk, 2 eggs, 1 can (16 ounces) pumpkin, 2 teaspoons vanilla and 2½ teaspoons pumpkin pie spice until smooth, 1 minute in blender on high speed or 2 minutes with hand beater. Continue as directed.